The following article and accompanying photos are taken from the June 1967 issue of Sporting Cyclist and are reprinted without permission. The magazine itself folded many years ago. The author of the article is probably Roy Green but there is nothing in the article to indicate this. If anyone knows the copyright holder and they have an objection I will, of course, remove this page. AFTER the Belgian Tour, most of the riders made for the French capital. I went to the northern terminal of Paris-Roubaix, to take a good look at the legendary dreaded pav�. Soon after arriving in the un-lovely textile city of industrial Northern France, I went to the "Caf� Caals" in the Grand Place, to meet a "contact" given me by Polhill R.C. pro-racing enthusiast Pete Duker. His friend Roger Caals certainly was a great "sportif"! "You want to look over our Hell of the North? You couldn't have a better guide! Put the bike in my car, we go out to Mons-en-Pévèle direct. You can test it out on the return-but you won't want to ride much, believe me!" 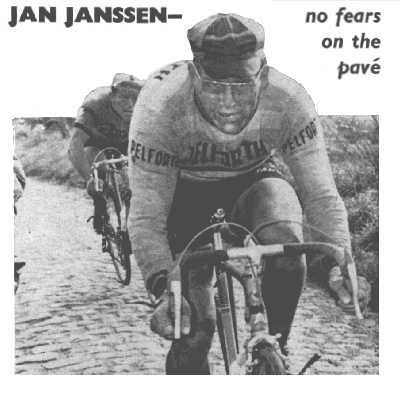 At Mons-en-P�vèle, the road from the south, the Paris-Roubaix route, was smooth asphalt. Then the route arrows pointed left, up a narrow farm track, barely as wide as a car. "This is the famous Pas-Rolland," said Roger. What a road! This was the place, Barry Hoban had told me, where "it all happens," where the decisive break is so often made. I could well believe this. It was surfaced, if that is the word, with the worst brand of cobble stone, dome shaped, large as loaves. They were set wide enough apart to twist a front wheel, with a wicked camber falling away to either side to make side-slip a deadly hazard. The gradient was not really much, but over such pavé it would be like climbing a wall. I could well imagine the confusion that an attack by the strong ones at the front here would cause. One false move by somebody in the bunch on the tricky descent following, with a sharp left-hand bend, and the path would be completely blocked. I became a little disappointed at what followed this taste of "hell," though. For the next 18 kilometres were over macadam road, rather bumpy, but with only rare short patches of the dreaded "casse-pattes," the "leg-smasher" pav�. I had expected all the final 25 miles to be murder - this was a bit of a let down. No, Sean Yates wasn't the first Brit to mix it at the front of Paris-Roubaix! Roger reminded me: "There are long stretches of really bad pav� before Mons though, for about 15km, between Denain and Fenain. Most of this here was bad, too, right up to last year; you can see the pav� underneath the tarmac layer. But the worst is ahead, for you to test yourself." Race previews suggested that the "Enfer" was softer this year. Apparently the public relations men of the local authorities, annoyed at the "bad image" Paris-Roubaix was giving the roads in their area, were pushing to get as much tar- maced as possible. "In 10 years' time it will be hard to make the race worthy of its reputation," said Roger glumly. At Chereng, some 10 miles from the finish, I took to the bike. Within half a mile my criticism of an "easy" route disappeared! It was difficult to stay firmly in the saddle at all. The spokes pinged loudly as the front wheel took the shocks; it was like riding up the kerb continually. I was riding "puddingy" H.P.s, too, not hard narrow tubs. After a couple of miles of this, legs and arm muscles, particularly biceps, felt like jelly, my wrists ached from gripping the bars so tightly. Alternation between smooth stretches and pav� was particularly jarring in its effect, as I found out after latching on to a cyclemotor and stepping up the speed for a few hundred yards, then turning off on to more pav�. I had originally intended following Paris-Roubaix in a press car. It would certainly have been an experience. Worried by the Editor's advice that, on such narrow roads, it is often impossible to get near to the front, I changed my plan, and settled for the impact of seeing one real close-up of the survivors. I chose the Cote de Beaumont, and, on that final difficulty, waited with the dense crowd. With transistors blaring away among every group, I knew what the pattern would be when they had arrived. 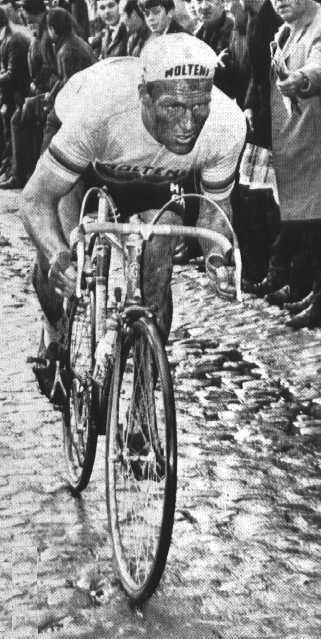 Barry Hoban's forecast had been right; the "Pas Rolland" had been the launching platform for a fierce attack by Rudi Altig. The only men who had been able to reply to the great world champion's power had formed a really "regal" 10-man break. Altig [Pictured Right -UD], Van Looy, Janssen, Poulidor, Merckx, Sels, Motta, De Cabooter, Van den Berghe, Planckaert - what a selection! The image of such top-line racing that one has is very different to what I actually saw that afternoon. Usually it is a multi-coloured whirr of speed and colour, a lightning glimpse of leaving vague impressions. But that is not Paris-Roubaix! The cold and rain of the morning, and a headwind all the way had dealt some weakening punches. Now the pav�, mixed with the inevitable crashes and punctures, were throwing out knock-out blows to all but the strongest. It was sunny by the time they reached the "Enfer," but the early rain and traffic had given the cobbles a coating of slimy treacherous mud. Through the cheering, shouting ranks, 10 mud-caked devils, eyes like staring orbs in their coal-black faces, slid and bumped past in a long, slow, line. There was no fighting burst from anyone; all 10, desperately weary from the savage efforts that had made them stand out from the mob behind, seemed intent only on beating the common enemy, the pav�. The film of human suffering ran on for almost another half-hour. But the actors immediately following the "lead parts," the next most valiant, only got half the attention they deserved. Ears were more important than eyes, as the radios sang out the changes in the Top Ten, a fast-tempo tune now, along the wide smooth run-in-road to the track. Surely the Belgian iron-men could, yet again, call the tune? There were six of them in the 10. Old campaigner Arthur de Cabooter made his last-ditch effort, entered the track first. Rik van Looy came in last; desperation for that record fourth victory sent him flying round the lot. Just half a wheel spoilt his dream, the wheel of ... JAN JANSSEN! 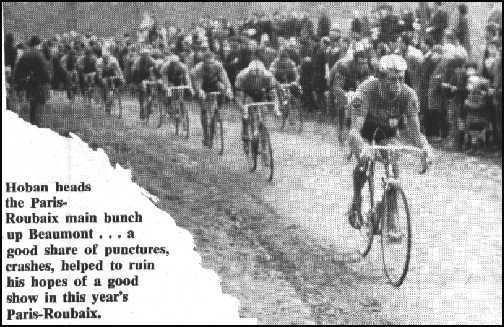 Meanwhile, back on that Hill Difficulty... the surviving 60-odd of the 162 pilgrims from Paris struggle by at about 10 m.p.h., split into many small units, biggest bunch, only around 13 strong, led by the only English survivor, Barry Hoban. The crowd give them all a warming welcome. In this race, more than any other they have earned it, survivors of one of the toughest tests a tough sport can devise. A moment of dark comedy ends the procession. The sag wagon, root piled high with many machines, fouls an overhead banner. Faces of despondent riders peering out from the back watch their bikes crashing down on the pav�... it's destroying stuff even when you've packed!